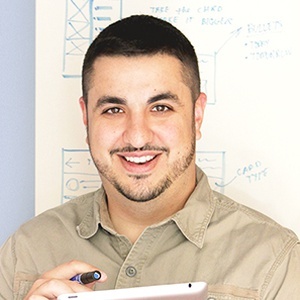 Joe is a Creative Director at QVC, Inc. managing the Product + UX Design teams in West Chester, PA. Ever since joining he has worked on building the brand across many channels. Whether it's a new digital interface, web design, or pioneering new technology like watchOS or tvOS, he has been a part of the process. If you’ve seen the brand, then you’ve seen his work. 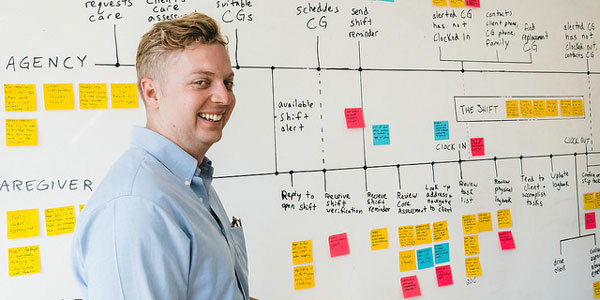 As a creative front-runner, Joe has helped establish, manage, and strengthen many brands with the simple intention to connect with problem solvers and people passionate about design. He resides in the suburbs of Philadelphia with his beautiful wife and three children. Outside of the daily grind he loves photographing landscapes in HDR, rides a Harley-Davidson on occasion, and enjoys playing his acoustic Martin guitar. [Yeti] What is unique about your personal philosophy towards UX design? [Joe] I’m definitely the type of designer to think more big picture about a problem. While I believe that incremental change will be the most productive way to grow the majority of products – I believe it’s important to always take a step back and approach your work through the lens of the user and discover what their influence is. It’s exciting to think about the journey of the user experience from all touch points of design. Perhaps it’s just instinct, but often I ask myself very simple questions up front, such as: What is the purpose of this?... or... Why does this matter? My conclusions will then set an all-encompassing tone for my direction as research, and concept development begin. [Yeti] How does that help guide your team's digital innovation efforts at QVC? [Joe] I believe it helps set the pace and level the playing field because our teams are rather large. The designers are holding each other accountable and referring back to one vision that we know we came to in unison. Doing this together also helps build a trust among the team. Having that coupled with clarity on what our goals will be makes the perfect recipe to innovate with. [Yeti] What does your design process look like at QVC? [Joe] At the moment we’re using a dual-track agile methodology for the design team. This is where my design team(s) will run and conduct their own scrum ceremonies ahead of when actual sprint planning for various projects begins. 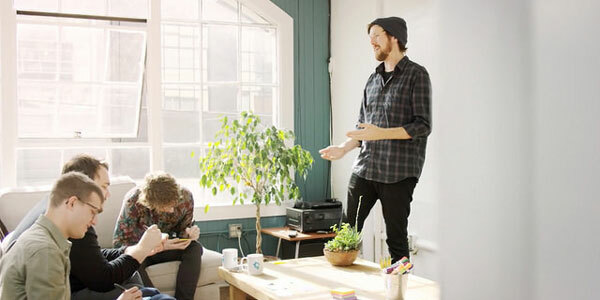 This gives us the opportunity to think more broadly about our products and have better thought out design solutions when we get more focused during sprint planning. [Yeti] What types of projects are you focused on in recent times? [Joe] Focusing a lot of my time researching the internet of things and how we can begin to look ahead in different areas as the landscape of TV retail is evolving. Always finding ways to reinvent our mobile experiences and prototyping ways to apply some of that innovative thinking to the business model. 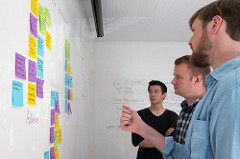 [Yeti] How is UX design playing a pivotal role in the success of these projects? [Joe] Spending a lot of time building relationships with other factions of the business in order to provide the knowledge base UX is building about the customer, and helping aggregate a seamless experience throughout. It’s important now, and especially for the future as technology grows — devices are getting better with syncing, and so on. It’s really exciting to be on the forefront of online retail. [Yeti] What is the most interesting project you've worked on while at QVC? [Joe] I had the unique experience of being part of a very small team that was handed the keys, so to speak, to build one of our most famous shows, In the Kitchen with David, to the mega success it is today. We spent a lot of time getting to know the demographic, testing new ideas almost weekly, and failing fast. We built this viral brand experience within only a few short months. Seeing the payoff and success was such a remarkable reward. [Yeti] What are some common misconceptions you've seen people often have towards UX design? [Joe] People will often hear UX and simply think of wireframes or general web design. It goes so much deeper than that and it also doesn’t just stop at digital. That’s at least how I’m trying to help inform and educate others in the industry. There are so many different variables that inform a user's decision. It’s important to think more holistically and not limit your ideas to simply digital. Even if your specialty is purely digital, you should still be thinking about how you can influence the entire journey. [Yeti] How do you see UX design evolving over the next decade? [Joe] I wouldn’t be surprised if the term ‘UX’ becomes something else :) – I believe there is going to be a rise of more generalist type designers, and we’re already seeing that shift in the industry today. I believe it’s going to become more and more important to not be a designer that is limited to just web, iOS, or Android. I foresee a possible convergence of all design types at the latter part of a decade. I believe that being able to think more holistically about user experience is vital for future success in the industry. [Yeti] What advice would you give to someone starting a career in UX design? [Joe] Don’t create limits. This work is fun and you have endless potential to branch out and build a resume with colorful experience. Embrace that you will make mistakes, after all, it’s part of the job to continuously iterate. Celebrate your wins and remember there’s always room for improvement. One of the most exciting aspects of this job is that you get to solve problems for a living. Be logical, create compelling work, and above all be passionate.